Classic New York Water Bagels topped with "Everything" Topping. Bagels. Can we tawk? First, let me just say that these Classic New York Water Bagels are simply wonderful. In fact, the two recipients (outside of my family) of these bagels told me that they were the best bagels they have ever had. I am not making this up. Bagels, according to the authors of Inside the Jewish Bakery, have their origin in eastern Europe, particularly Krakow, and were given as gifts to women in childbirth, as well as the women, such as midwives, who assisted them. Bagels came to America with the emigration of eastern European Jews in the late 19th and early 20th centuries, and were recreated in basement bakeries in densely packed neighborhoods. According to the authors of the book, the original bagels were made of flour, water, malt, salt, and yeast. Once the bakers shaped the dough into rings, they allowed them to ferment for at least 12 hours before boiling and baking them. In the early 20th century, the Yiddish bakers formed a union, Local 338, called the International Beigel Bakers Union of Greater New York and New Jersey (Ginsberg and Berg). This union had a tight hold on the bagel trade for decades. To find out "the rest of the story" definitely check out the book. It's such an enjoyable read. The authors have definitely done their research. In the US, most white flours have added malt already, which is used to help the yeast do its thing. It also helps the dough brown while baking. It's a sprouted grain, usually from barley. I'm not even going to attempt to explain sprouted grains (because I can't), but, rest assured, there are an amazing amount of geeks out there who are totally into this. Diastatic malt versus non-diastatic malt? What's the difference? Non-diastatic malt has had the enzymes deactivated, and is simply used for sweetening (most of the bagel recipes I've seen call for non-diastatic malt). According to the literature, diastatic malt (with active enzymes) is used in small quantities, especially when there is a long proofing time. It helps produce more sugar to help with the caramelization of the crust. Thank goodness I did not read about it before making these bagels, because I might not have added as much as I did, and I might not have ended up with these amazing bagels. Trust me, it worked out. If you can't find diastatic malt powder (I got mine from King Arthur Flour), you can use barley malt syrup, which is easy to find at Whole Foods or health food stores. Another hallmark of hand made bagels is shaping. In the past, I have formed the dough into balls, and then poked a hole in the middle and stretched it into a ring. This time, I rolled the dough pieces into 8 to 10 inch strands, and wrapped them around my hand to form a circle, and sealed the ends by rolling the overlapped ends with the palm of my hand on my work surface. I've made bagels before, and I've been pretty happy with them, except they turned out kind of wrinkly. I suspect this shaping method prevents that by helping to develop the gluten into long strands. This shaping method also helps develop chewiness. Just be sure the ends are completely sealed (I used a few drops of water) or they might come apart in the boiling water. These are excellent both plain or sprinkled with the topping of your choice. 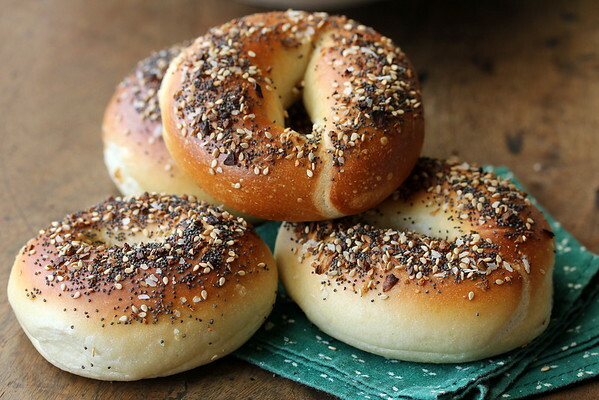 I sprinkled my bagels with a mixture of poppy seeds, sesame seeds, dried minced garlic, onion flakes, and Kosher salt, which I found out later, makes them Everything Bagels. How did I not know that? How much time does it take to make these bagels? This recipe takes two days to make, with only about an hour of hands on time. Make and shape the dough in the afternoon, and then boil and bake the bagels the next day. There is no bulk proofing involved. My bagels did not rise at all in the refrigerator. All of the magic happened in the oven. Note: You can make this dough in a stand mixer or by hand. It is a very stiff dough, so do not walk away from you mixer. Keep an eye on it for any strain the dough might cause. After the recipe, check out the links (there are nearly 20!) 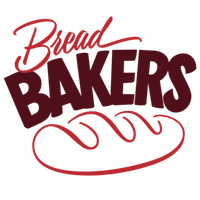 for the rest of the #BreadBakers group's bagel recipes. I can't wait to try them all. Dissolve the malt in the water. In the bowl of your stand mixer (or a large bowl, if you are hand kneading), whisk the flour, vital wheat gluten, salt, and instant yeast. Add the water, and stir with a dough whisk or large spoon to hydrate the dough. Knead the dough, either by hand or dough hook, for about 10 minutes, until smooth and stretchy. I had to add an additional tablespoon of water to my dough. Turn out the dough onto your unfloured work surface and form it into a 12 inch long log. Slice the log in half, lengthwise. Roll the halves into 2 inch round logs, cover, and let them rest for about 20 minutes. Cut each log into 6 three ounce pieces, and roll them into small logs and cover with plastic wrap. One at a time, roll each piece into an 8 to 10 inch strand, wrap it around your hand, over lap the ends under your palm, and roll them together on the work surface. Sometimes a few drops of water helps glue them together. If the dough resists rolling, let it rest, covered, to relax the gluten. Place each shaped bagel on a parchment lined baking sheet, and cover with plastic wrap. When you are done shaping, cover the baking sheet with plastic, and place it in the refrigerator until the next morning. On baking day, preheat the oven to 460 degrees F.
Bring the water to a boil, and add the malt. Remove the bagels from the refrigerator, and one at a time, plunge the bagels into the boiling water and remove them with a slotted spatula or spider strainer when they float. Mine didn't sink at all, so I left them in the water for about 60 seconds, flipping them halfway through. Drain on a rack, and sprinkle with your topping. Place the bagels on a parchment lined baking sheet, and place them in the oven for 18 to 20 minutes, until they are browned and reach an internal temperature of about 195 to 200 degrees F.
Let cool on a wire rack for about 30 minutes. These can be kept in a paper bag for about a day. To keep them longer, wrap each individually in foil and place them in a freezer bag and freeze. Thaw as many as you need individually overnight in the foil. Adapted from Inside the Jewish Bakery: Recipes and Memories from the Golden Age of Jewish Baking. Note: If you get the book (which I recommend) there is a fairly lengthy downloadable errata document for this book, depending on the edition you have. They look so perfect I expect to see them in a kitchy cafe on the upper east side. Yum!! 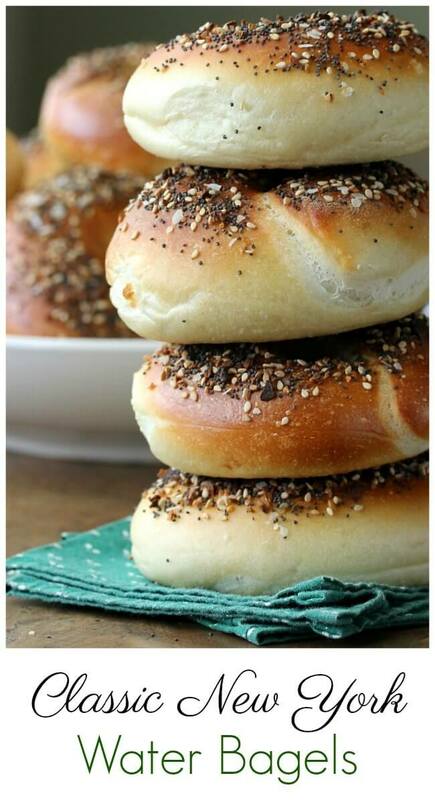 Your bagels look amazing! I'm drooling over here! I definitely need to check out this recipe ASAP! Thanks Heather! Thanks for hosting this month! 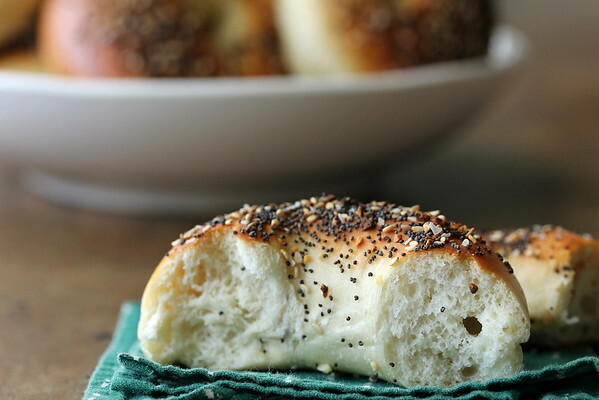 Absolutely perfect bagels! I knew they would be because you are such a talented baker. Renee, you made my day. So much to learn about bagels! Beigels?! Now I'm all intrigued by malt and diastatic malt and whatnot. And the shaping--I actually considered the rope thing but didn't think my sealing skills were up to the challenge. It does make sense that the gluten strands would be longer using that method. I will try that next time. And another thing--the extra vital wheat gluten. I also thought about doing that for extra chew. I let half my guys hang in the fridge for 5 hours and the others for 15 hours. The 15 hour guys definitely had more chew. I wonder if using VWG and a shorter rest time would yield the same results...? So many questions to answer and so many bagels to make. Yours are simply beautiful, Karen! We'll just have to keep baking bagels, right? Now that's the loft a bagel should have! What gorgeous roundness you achieved, Karen. They are stunning! Also, thanks for the short history lesson. I love learning about food and its origins. P.S. I miss Joan Rivers. Your opening line made me laugh. Thanks Stacy. =) Me too. Yes, these are stunning! I was reading along and wondering how you got the outside so smooth and see that you mention the forming technique-- I am going to try that next time to see if I can avoid wrinkles in my bagels. I've been nervous about trying it, but I'm so happy with the results. Wow...these look absolutely incredible. I think I will have to try the shaping method of joining two ends of a rope, rather than poking a hole in the dough ball. Most times I have made bagels they have come out a bit wrinkly like you described. Thanks for all the great information! Thanks! I was really excited about how smooth they were! I trust you, so I know you are not making any statement that is not true. HOWEVER, it would be nice to put these bagels to a taste-test. Mine did come apart so I appreciate the seal with water tip. I made hundreds of thousands of New York water bagels when I worked at Bagel Maven in the 1980's. The smell of fresh bagels baking is still one of my favorites. We used an old family recipe straight from their NY deli days. Best bagels ever! I am so impressed that we have a bagel master in our midst!! I never knew that flour had malt added to it. I need to read up to see which brands have it added. Yuor bagels look amazing! Perfect, really. If you grind your own flour, it won't be in there, but most packaged all purpose and bread flour in the US will have it in there. Your bagels are absolutely perfect! I can see why your friends said they were the best they've had. They look great!! Thank you Sophia! I still get giddy when things work out. 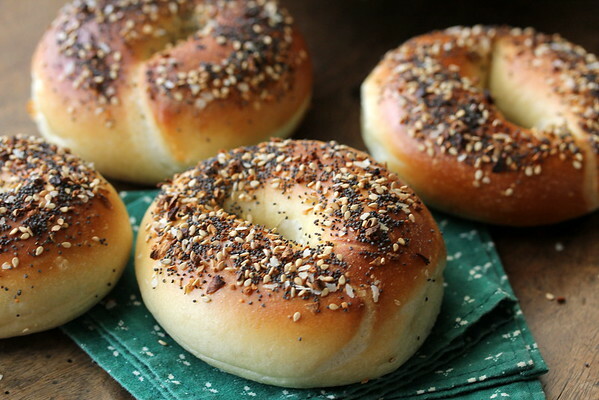 These bagels look amazing! It's been so long since I've made bagels, I need to again! That right up there? Bagel perfection. That's all that needs to be said. I bow to you. These are extremely impressive. 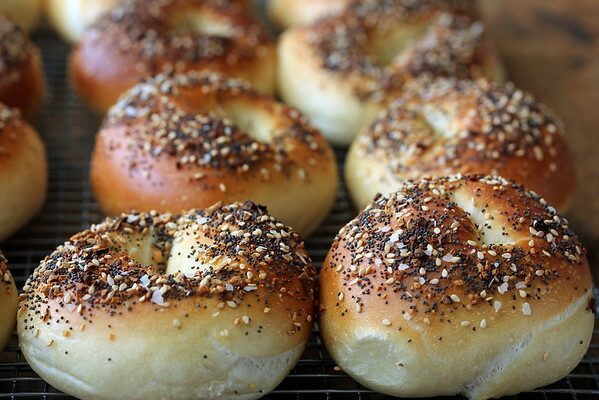 Honestly, there are plenty of "bagel" places in NYC that could use your recipe!! Born and raised in N.Y. 6 years in NYC and this is the best recipe ive used to date. I made these and came out great im gonna try adding more salt and a bit more malt powder and im hoping it will rival or beat out my favorite bagels in NYC....its darn close as is great job! Love this recipe... just baked them. Wish I could upload a picture. As a lifelong NYer, I will certify that these are the real deal. I tried Peter Reinhart’s recipe, but it doesn’t include the vital gluten... which takes up 100 notches! Next time I think I need to add more water to make the rolling process a little easier. I did add a couple of tablespoons but it must have been zero humidity in my kitchen because they needed a little more. I will be making this recipe every week! Thank you!! !